— Totally. It just wouldn’t be the same on, like, a TV. — I mean, my TV is actually kind of big. — Yeah, but on a screen that’s twenty times bigger. It’s just… more. — Yeah. You can see the special effects better. — See, I don’t actually care that much about special effects. As long as it doesn’t look like first season Buffy, I’m good. I’m actually there to see story first, acting second, camerawork maybe third… and then special effects way after those. — But it’s a comic book movie. You have to rank the special effects higher. — But I don’t because it’s a comic book movie. It’s expected to be effects-laden. Besides, I actually read comic books, where the special effects are pretty terrible — just two-dimensional drawings on a page. And they don’t bother me any. — It’s a completely different experience. It’s like comparing… a concert and an interview with the band you read in a magazine. 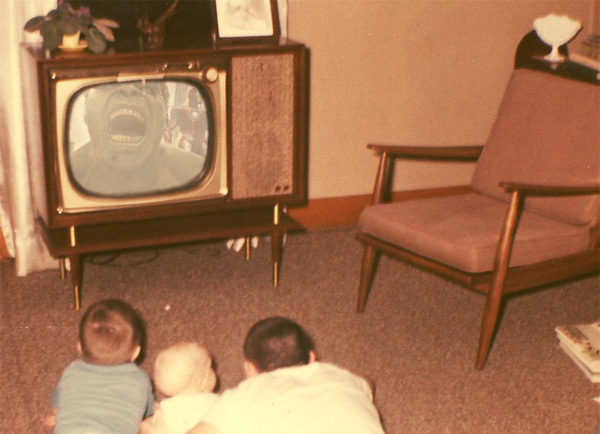 — Wouldn’t seeing special effects on a TV actually make them better, on account of the fact that something like pixel distortion would be a lot harder to see if the pixels weren’t all the size of child’s head? — You’re not getting it. When the special effects are on such a grand scale, you can’t help but to feel like the movie is actually real. — “Actually real.” I’m supposed to think that Mark Ruffalo has turned green, grown super muscular, split all his clothes except for his pants and is now bounding across the city skyline? — That will never happen. As much as I love movies, I’m always keenly aware that they — and superhero movies in particular — are not real. — Well, there’s also the sound. It’s… really loud. — Nope! Done! I just won!